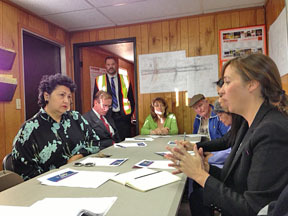 RESIDENTS attended a community meeting with MTA officials last month. The construction site for an extension of the Purple Line from Western to La Brea avenues is a little too close for comfort for residents of Lorraine Blvd. Many live within feet of the supermarket-sized staging yard set up at the corner of Wilshire Blvd. where round the clock trucks pull into the facility that is surrounded by a tarped chain-link fence. The noise, light (at night from portable generators), ground vibration from the dump trucks, homeless urinating and living in the area and litter is overwhelming, residents told Metro officials at a community meeting last month. “The impact on Windsor Village residents will be horrendous” on this estimated 10-year project, R.J. Strotz, member of the Windsor Village Association Board of Directors, wrote in a community bulletin. A community meeting with MTA officials was held last month with some constructive results. MTA purchased the 1.5-acre lot in 1985, and its use for subway construction has been discussed for years, Metro officials said. They plan to investigate a list of issues that were brought up at the meeting, spokesman Jody Litvak said. Among the host of issues raised are sound blanket fences installed around the yard, landscaping and increased litter pick up. A hotline on the project is available at 213-922-6934. The Greater Wilshire Neighborhood Council Transportation Committee will hold a progress meeting on neighbors’ concerns Thurs., Jan. 30 at Wilshire United Methodist Church, 4350 Wilshire Blvd., from 6 to 7:30 p.m.